Hi, I am interested in your 1951 Ford Custom (stock #4790-CHA) listed on Autotrader for $24,995. I'd like to get more information about this vehicle and confirm its availability. 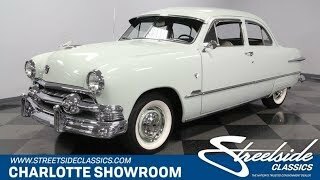 This 1951 Ford Custom two-door sedan hits that perfect balance of a cherished classic with its pastel/chrome exterior, and its also the bad boy with a tuned V8 lurking in the engine bay. This makes for a total package that is as easy to love as a comfortable cruiser or your incognito hot rod. Today we would call any two-door car like this a coupe, but Ford called it a sedan in 1951. You can instantly see why in its profile with the large rear roll down windows. The benefit of a bodystyle like this not only gives the rear passengers more room, but you also get to educate a few people at the car shows as they search for the rear door handle. Like any good 1950s car, theres plenty of chrome on the bumpers and on the highly stylized grille. And this one really has extra elegance in its details. Those dual bullet-nose elements leading the way, fender skirts, taillights that integrate into bright trim, and full-length side trim that seamlessly wraps around the rear its all part of a stunning package. You can see it all so well because of a quality respray of Sea Island Green that happened later in life. The car was also lowered 2 so you have a tasteful, custom look, that adds to the overall presentation. The interior was given a nice restoration that looks terrific while still respecting the Fords vintage roots. For example, the seats were reupholstered, but they follow a correct stripe and button-top pattern. These seats coordinate with the door panels and dash to create a great uniform total feeling. The atmosphere is absolutely like an authentic time capsule, but if you look closely, you can spot some worthwhile upgrades. For example, the steering wheel was upgraded to a Limeworks Cresliner, at the tune of $1000 (the original comes with the sale) and the radio is an AM/FM unit for better cruising tunes. Under the hood is a terrific presentation. After all, if youre a Ford fan, its hard to beat the dual pipes diving into the famous flathead V8. But you can also tell from this show-worthy presentation that there have been some nice investments here. It now includes an Isky cam, Offenhauser finned heads (originals included), Fenton Headers an alternator (8 volts), electronic ignition, electric fuel pump, and much more (call for all the details.) Plus, its topped with a Holley four-barrel carburetor. So you have extra power that also helps give the dual exhaust a sweet tone. You are in complete control of it all thanks to the column-shifted three-speed manual transmission with overdrive. And all of this completed in 2012, verified by receipts. This classic has a full history that includes a long-term first owner and his son performing a quality restoration. The sale also comes with title documentation, owners manual, build receipts, maintenance records, a new car cover, and a bunch of original components. Its a distinct and iconic Ford with a story to tell. So dont miss your chance at this exceptional classic, call today!